An icon such as the Range Rover needs absolutely no introduction. Launched in 1970, the Range Rover received the award of being an exemplary work of industrial design in the very first year of its existence. 43 years down the line and Land Rover continues to do exemplary work with the fourth generation Range Rover. Clearly no compromises were made in the development of this vehicle and one glance on the spec sheet is enough to convince that the new Range Rover is just not any vehicle, it’s an engineering masterpiece. Land Rover has pushed the very limits of vehicle design and the new model has been developed from the ground up. With thorough changes over its predecessor, the 2013 Range Rover is a drastically improved SUV, which has the capability to conquer any terrain. The latest model is so good, that it is often touted as the best car in the world. The new Range Rover is all new under the skin and over its chassis. But the changes on the outside have been made with caution so that its instantly recognisable form continues to be so. In fact, some of the design elements like the side vent fins have been retained even though they don’t have a function now and are just a cosmetic add on in the fourth generation.Amongst the other features that have been carried forward because they are a classic Range Rover trait is the split tail-gate. Only, in keeping with current day tastes and expectations, both of them are powered gates that fold and lock at the push of a button. The lineage of every Range Rover is best observed when it is seen from the side. Starting from the first generation of 1970, all of them have effectively started out as three parallel lines on the drawing board representing the roofline, waistline and baseline. All of them have had a longer rear overhang with a slightly tapered rear and a purposeful departure angle.The design tradition continues in the fourth generation, with the only minor modification being the slightly lowered roof that also marginally tapers down at the rear. Blacked out A, B and C pillars also mean that the floating roof design tradition continues too. Incidentally, the roof also features the largest panoramic sunroof glass in a sports utility vehicle. The overall dimensions of the new Range Rover haven’t been changed very much; after all it already was a hulk. But, it is about 3 cms longer and a bit wider. But the bigger numbers start flowing when you look under the skin..The new Range Rover’s exterior design elements such as the headlamps and tail-lamps borrow a bit of the Evoque’s design cues. But the purity of the Range Rover flagship’s design is still maintained by keeping the changes within the limits of the brand’s classic traits. It also gets a dose of modernism with LED lights and auto door close mechanism. The classic clam-shell bonnet continues, only now it hides a neat trick that has enabled the new Range Rover to get into almost waist-deep water. Just like the exterior the interior too gets a touch of sophistication along with a perfect blend of engineering and technology. The driver seats, in particular, get a sporty and commanding view of the road ahead while it also gets 20-way adjustment and heating, cooling and massage functions. The seats, in particular, have been designed keeping the ease of entry and exit in mind. The rear seats, in particular, can actually be folded in 40:20:40 format and are also available with heating and electric recline options. The cabin in particular also gets four-zone climate control and cabin air ionization system. The dashboard towards the front houses two high-definition 10-inch touchscreens of the new Touch Pro Duo infotainment system. The instrument panel too has been neatly laid out which ends towards the Terrain Response and Terrain Response 2 controls into Touch Pro Duo. The integration of these controls has helped in eliminating the traditional dials giving the central console a cleaner look. The instrument cluster, in particular, gets twin-analogue deals with a 5-inch TFT display in between them. The two-dial layout with an information panel in the centre, a one-dial layout flanked by dual information shows a full map view. The Velar also gets a full colour head-up display which provides some major information like speed, turn-by-turn navigation instructions, and active safety system warnings. If we talk about seat upholstery, the Standard models feature Suedecloth and Luxtec upholstery with distinctive twin-needle stitching. While the top end S and SE models upgrade to high-quality, perforated grained leather. The top of the line HSE trim gets luxuriously soft perforated Windsor leather upholstery.If we talk about space, both the front and rear seat passengers get plenty of space inside the Velar also provides an impressive 673 Litres of boot space at the back as well. To get an easy access, Land Rover Velar also features a gesture controlled tailgate as well. Coming to the infotainment system with the Velar compact SUV Land Rover is going to debut their latest and the most advanced Touch Pro Duo infotainment system which features two high-definition 10-inch touchscreens. The occupants can individually select and display on the main part of the screen to provide more detailed information and user options while the side panels provide an easy access up to five frequently used functions such as navigation, media, phone, news and weather. The lower touchscreen, in particular, manages features like climate control and Terrain Response services. For the entertainment of the passengers inside the Velar gets a 1,600W Signature Sound System developed with renowned British audio experts Meridian. The fourth generation Range Rover features all new underpinnings and Land Rover engineers have moved to an all aluminum monocoque construction which lends to higher weight savings over a steel body. The light weight body weighs 39% less than its predecessor, which is quite a massive reduction for a vehicle which has grown in size and technology. The benefits of using aluminum are several, including higher stiffness, reduced fuel consumption and better performance. The new Range Rover also has a greener footprint which will please the environment conscious around us. On offer in India are two engines, a 5.0-litre supercharged V8, which produces 510 PS of power and 625 Nm of torque, offering sports car like performance with 0 – 100 km/hr coming up in around 5.2 seconds. The more popular engine of choice is going to be the 4.4-litre V8 diesel, which churns our 339 PS of power and a monumental 700 Nm of turning force. This oil burner performs fabulously and moves the 2.4 tonne Range Rover effortlessly. There is barely any lag from the 8-cylinder motor and performance is instant with the Range Rover having more than enough pep every time you floor the pedal. The lower weight has definitely given the new Range Rover improved performance. The vehicle feels equally at home in low speed driving conditions as it does during high speed cruising. A small tap on the accelerator is more than enough to overtake and the engine is super refined with barely any noise audible inside the cabin. Performance is so strong that if you let this SUV loose, it will comfortably pull to triple digit speeds without giving you a hint of all those horses galloping on full steam. Redline comes in at 4000 RPM and when you reach the high end of the revv band, there is slight whoosh from the motor. Mated to this engine is a 8-speed automatic gearbox, which shifts cogs with butter smooth precision. You never notice when gears change, such is the level of secrecy adopted by the transmission. There are paddle shifts on the steering wheel, which enables you to take control of things through Land Rover’s Command Shift System. At 100 km/hr in eighth gear, the engine will cruise in a very relaxed manner ticking in at just 1200 RPM. There is a Sports mode too on the gear knob, which makes performance all that more urgent should you feel the need for speed. Range Rover with its now improved power to weight ratio and aerodynamic design is a great handling Rangie by miles. It is calm and composed and powerful and offers decent agility over the corners. It is definitely not as handy as the Range Rover Sport but it is a very well sought-out machine in itself. However, the steering now feels a bit over assisted and numb and therefore it lacks the connected feel of the previous model. Nevertheless, the adjustable suspension system works wonderfully with various other ride controls to deliver a nice planted and plush ride quality even on horrendous surfaces. The world-famous terrain response system with an additional auto mode takes the go anywhere ability of the Range Rover to a whole new level. Further, it is assisted by active rear diff-lock, hill descent control, dynamic and roll stability control, traction control and many other controls to keep it maintain the Land Rover legacy. Water wading capacity is an astonishing 914mm (even better than the Land Rover Defender). Therefore, the Range Rover is still the best off-roading vehicle out there with latest technologies and creature comforts that can explore almost any terrain and you won’t have to make an appointment with your physiologist afterwards. The 2016 Land Rover Range Rover comes equipped with antilock brakes, traction and stability control, front-seat side airbags, side curtain airbags and active front head restraints. The Vision Assist and Driver Assistance packages add additional safety technologies (see Body Styles, Trim Levels and Options, above). All models also feature Emergency Braking Assist, which uses forward-sensing radar and primes the brake system if a collision seems imminent. The available adaptive cruise control system adds full automatic braking capability (Intelligent Emergency Braking) in case the driver doesn’t respond in time. 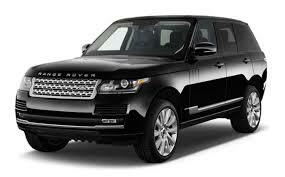 The Range Rover is one of the most complete and decorated SUVs in the market. Its all-round performance will please the driver greatly. However, there is some criticism regarding this vehicle. The effect on theenvironment was not considered, and there were some issues with it in 2007. The low resale value after the warranty period is a common complaint.